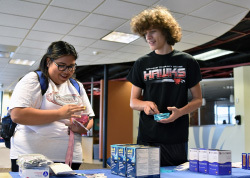 NORFOLK, NE - Students Victoria Gaona, Gibbon, and Joseph Walsh, Ravenna, assemble “Ouch Pouches” – small plastic tubs filled with first aid necessities for Bright Horizons of Norfolk - during a national day of service and remembrance on Tuesday, September 11, at Northeast Community College. Gaona and Walsh were among hundreds of Northeast students, faculty and staff to participate in “Northeast Serves,” an event that allowed them to create items that will be given to local community agencies and organizations. In addition to Bright Horizons, items will be donated to the Animal Shelter of Northeast Nebraska, Furbaby Rescue, Puppy Love, Behavioral Health Services, Norfolk Rescue Mission, Norfolk Police Division, Norfolk Fire Division, Meals On Wheels, Bright Horizons, and Heritage of Bel-Air.